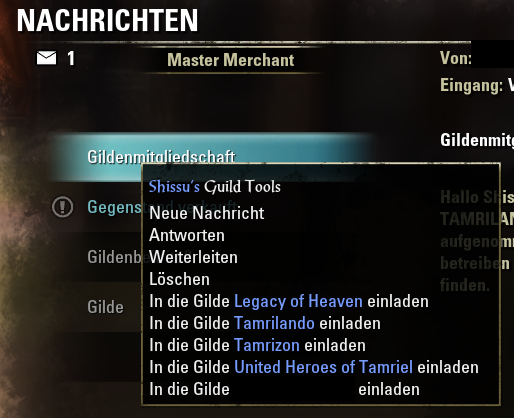 Shissu's Guild Tools ist/wird die "Eierlegende Wollmilchsau" unter den Gilden Tools. 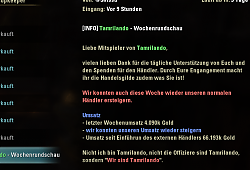 Das AddOn bietet dem Nutzer eine Anzahl von verschiedenen Tools rund um die Gilde. Jedes Tool lässt sich separat ein- und ausschalten! - Willkommennachrichten: Auswahl von verschiedenen Nachrichten per Zufall auf Wunsch. - Ist der Spieler in Sichtfeld in deiner Gilde? - Offlinespieler werden in der Zonenspalte mit der korrekten Offlinezeit dargstellt. Keine Rundungen durch ZOS. - Massen EMails an Gildenmitglieder und Freunde! - Spieler XYZ hat einen vollen Briefkasten und kann keine E-Mail erhalten und viele weitere Informationen. 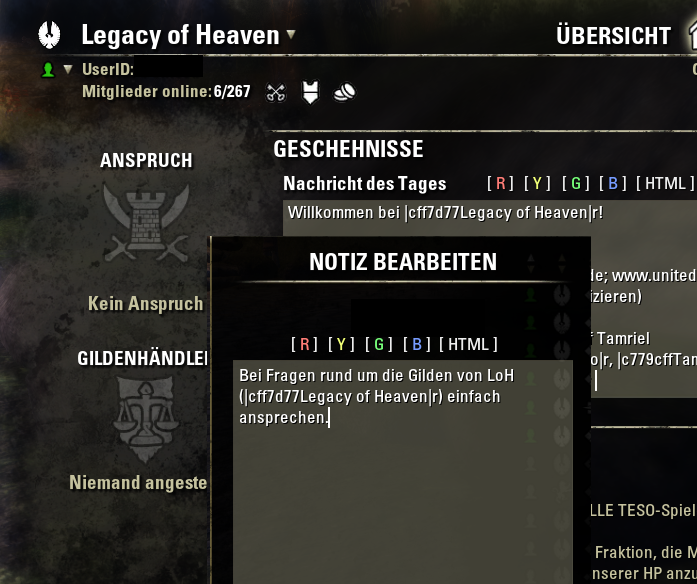 - AUTOAFK - Du gehst nach x Minuten AFK, wenn du dich bewegt oder etwas in der UI machst, wird dein Status wieder auf deinen vorherigen Status gestellt. 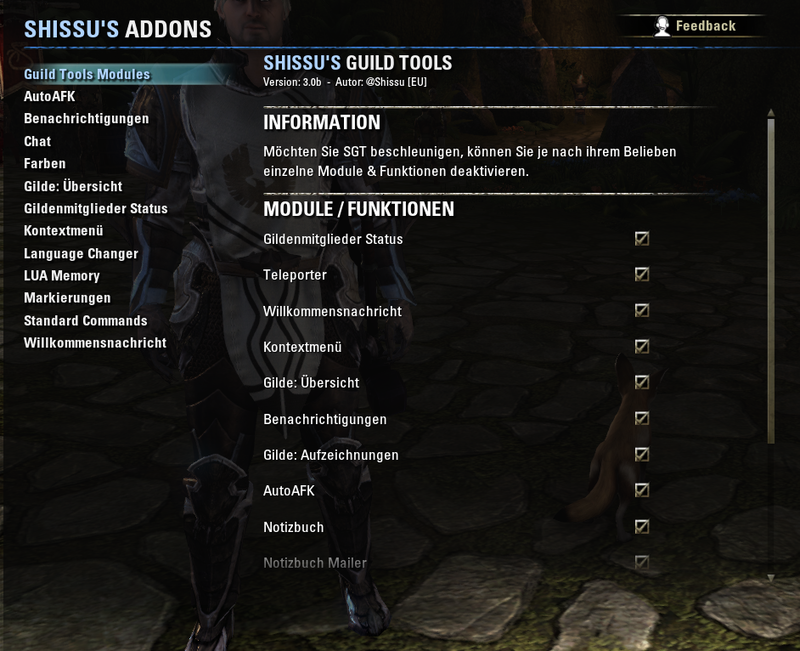 Shissu's Guild Tools is is the "Egg Wollmilchsau" among the guilds tools. 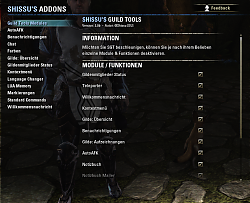 The add-on offers the user a number of different tools around the guild. Any tool can be switched on and off separately! - welcome message: Selection of different messages at random on request. - If the player is in the field of view in your guild? - Offline players dargstellt in the Zone column with the correct time offline. No rounding by ZOS. - Player XYZ has a full mailbox and can not receive an e-mail and many more. - AUTOAFK - You go after x minutes of AFK, if you moved or something in the UI are doing, your status will be restored on your previous status. Historyscanner Idea based on @Arkadius1 (EU) - Thank You! - new module: CompareMember between Guilds, more as 2 guilds possible! 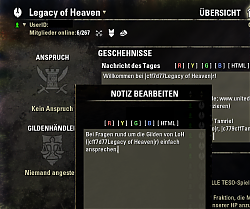 - Localization: some string replaced by ESO's own string. No additional resources through additional variables! 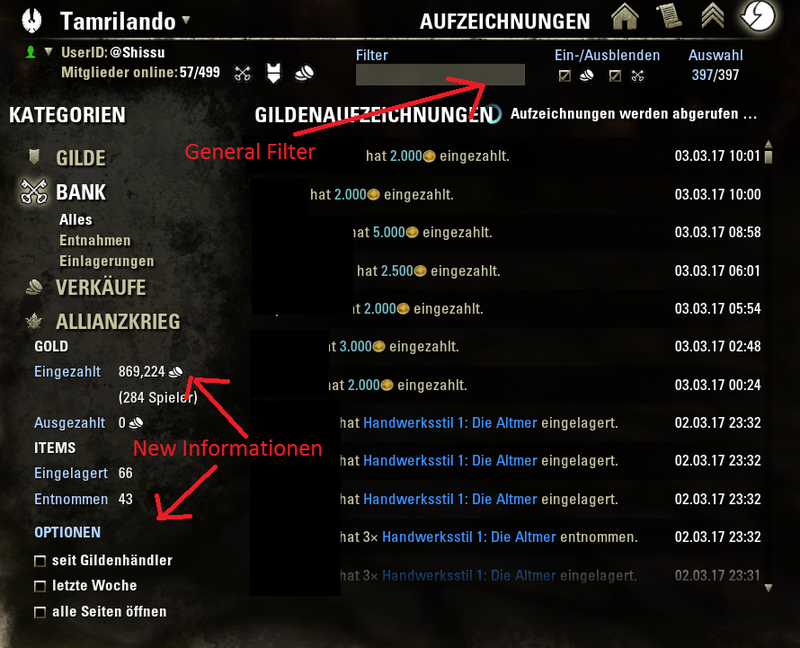 - EDIT: The note that the "background information" have changed is now displayed in the notifications, instead of in the chat! - NEW: Notification: Your rank has changed. - NEW: Notification: You have left the guild / have been kicked. - NEW: Notification: Membernote has changed. - NEW: Notes, mails can now be selected directly in the window: New Mail. - The filters in the notebook function correctly again. - INFO: The display of the sales will be revised in the next versions regarding efficiency. * New The current position is displayed. * New Teleporter functions are now displayed to friends and group members. * New You can teleport to the group leader. * New A new search filter: very quickly find your destination. * New The window was slightly enlarged. - FIX: Settings: Member in Sight! - New setting: Which guild should use information for the chat! - The distance between names and the guild listing has been changed. - Bugfix: Missing variables have been corrected. - Reminder: YOU ARE OFFLINE! - Notebook Mail Recipient ---> List Window! - Replace Chat Functions through Function with libChat2 Library. - It should appear no more mistakes when someone invites a player in a guild and you are currently in the loading screen. - Notebook: You can no longer translate it, if it is disabled via the preferences. A message is posted in the chat. 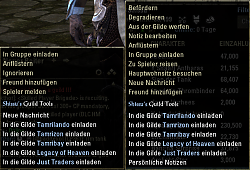 - Window "Player in Guild" stored now hisposition again correctly. - Guildroster & -history Fix: New Label & Button Anchors. | Now compatible with the new Roster Function from Master Merchant. Is there any chance of an update or at least a patch? Simply updating the API in the text file isn't sufficient since there is overlapping text on the history pages which make reading them difficult. I always get this error when I log into a character & typically a couple of times while playing. Not sure what the trigger is though. Thanks for taking the time to create this addon. Hope to see an update soon. Just wondering if there is any chance of an update to this add-on? It's one of my favorites and would hate to have to get a new one and figure it out. I have a problem with the guild bank deposits screen when i open history in the guild bank. When i press g again to close guild history the guild bank deposits screen (this extra new screen when you open guild history) doesnt close wich is realy annoying cause now i have to click X to close it. So now i have to close 2 screens instead of one. How do i fix this? I'm getting the below error whenever I try to use the Personal notes function. Side note- I'm glad something was finally updated to note that ShissuColor was a requirement for ShissuRoster and Notebook. I fixed my problem atm with going back to version 3.0. 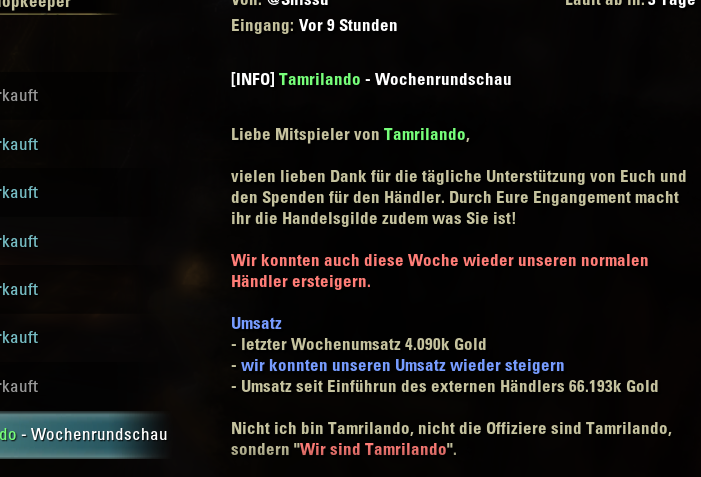 There are still some problems, like that i cant delete mails when SGT activated (maybe a problem with other addons in combination), but at least I am getting donation info now. Last edited by Verbalinkontinenz : 10/04/18 at 08:25 AM. 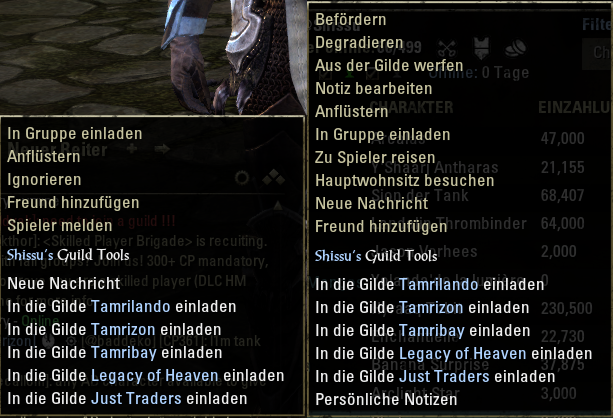 Whenever I log in to an account that has the guild tools module active, it spams my chat with literally hundreds of lines of text. Here's what it looks like when I open my chat box as far as I can - the size of the scroll bar should give you an idea of how much text this thing is posting. This seems a little broken. Is there a fix? I would like to know that too. Due to this i just switched addon off since i cant see what i bought in guild store without scrolling pages and pages of chat, when i relog to other characters. Great add-on but because of this i had to switch it off also. You should really add at least option to switch it off. I have the exact same issue. Do you all use pChat? Whenever I disable it, then I no longer see the messages. So I am wondering if it has something to do with those 2 not working well together. It's incredibly annoying either way. Didn't test this yet, but from looking at the code this should work properly (printing the version information once). 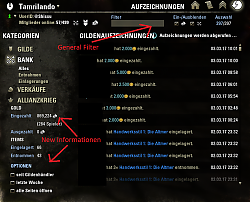 to the others: which one is the last version, where the guild roster information has been working and were i could delete mails? This sounds like this one here (1 line difference where the error occurs, this might be due to different versions). You may try this. I get this when I log in or reload UI. OMG! Finally a fix for the damned roster! Now if only we could get it to stop displaying so wide that it goes outside the Roster Window! Regarding the second question, I have absolutely no idea which feature you mean. 1) How do i automatic invite people to my guild? Is it possible with that tool? 2) Using the "/sdf" command it shows me the guilds payments, but displays "NO data" - any suggestion? 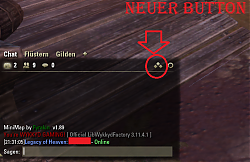 3) What is that (new) button on the very right of guild menu with the 3 blue dots good for? Can i ignore players or observe players?? How do i can see if someone eg sells less than 10k?? Last edited by Verbalinkontinenz : 09/16/18 at 02:12 PM. 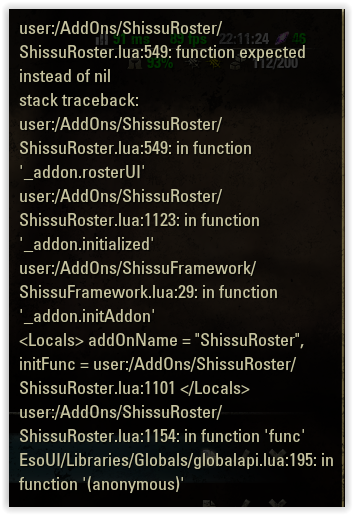 Is there a reason why I can't use 2 of these addons, despite the dependencies being installed? As you can see, Framework and History Scanner are installed and turned on.